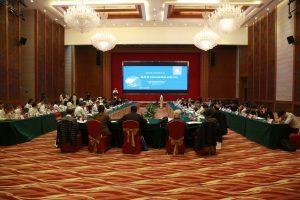 On January 25 and 26, 2018, the Hongkong-Zhuhai-Macau Bridge (HZMB) Island & Tunnel Engineering Immersed Tunnel Technical Summary Exchange & Consultation Meeting had been held in Zhongshan. The meeting was organized by CCCC JV tunnel & island engineering project management department. 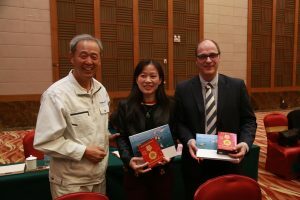 TEC managing director Hans de Wit and TEC’s China representative Ying Li were invited as experts for the meeting. On the morning of the 25th Jan meeting, Lin Ming, CCCC chief Engineer introduced the project construction status, and extended his heart-felt thanks to the experts for long-term cares, supports and devotions for the project. 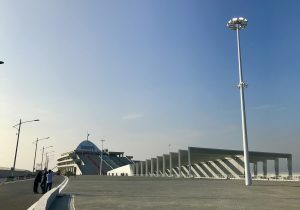 He thanked in particular the international team participations and contributions, especially TEC as the client’s consultant has offered help over 7 years. Mr. Lin praised this is an unprecedented international project in China. At the meeting, Mr. Lin presented the experts with a commemorative medal for their participation and a photo album called “Building and realizing dreams”. Particularly TEC (Hans de Wit) was awarded a contribution award inscribed with his own name in the glazed sculpture for his outstanding contributions to the tunnel works of the project. “HZMB tunnel operation status monitoring”. Over the seven years, the project management department of CCCC JV had organized key technical research projects for the difficult issues and had successfully built totally 6.7 km deep subsea tunnel composed of 33 elements through theoretical researches, field tests, design theory and construction technology research and development, equipment and control system research and development, developing risk control system and consultations from domestic and foreign experts. The experts visited the site and could witness the great achievement realizing this magnificent project. Hans de Wit said at the meeting that the HZMB is one of the most challenging sea crossing projects in the world. The island and tunnel engineering is the most complex and difficult part for the project. The innovative closure joint research, development and application have been the contribution to the immersed tunnel projects in the world. 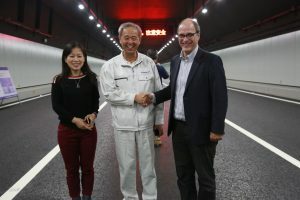 Through the realization of the HZMB immersed tunnel, a new standard has been set up for the construction of immersed tunnels in the world, and the limit of the technology has also been extended.